A delightful, delicate dessert that’ll be a triumph if temperature and measurements are carefully managed. With the accurate, easy-to-read Oven Thermometer you’ll know exactly when your oven is spot-on, while the Dual Platform Digital Scales – with one high-capacity weighing platform and another for readings in increments of 0.1g – deliver the precision needed for perfect pastry work. To make the pastry, add the butter, egg, sugar and milk in the bowl of a stand-up mixer fitted with a paddle attachment and mix until just combined. Switch the attachment to the dough hook, add the flour and knead the dough until it just comes together. Press into a ball, cover in clingfilm and chill for 2-3 hours. Preheat the oven to 170°C. Roll the pastry out to 3mm thickness between 2 sheets of parchment. Place in the fridge for 10 minutes. Remove and line a 23cm loose bottomed fluted flan tin. Roll any excess dough into a small ball, dust with a little flour and press into the corners of the tin. Allow the pastry to overhang. Reserve any leftovers. Take a large sheet or parchment paper and roll into a ball. Stretch back out and line the tart case. Fill to the edge with baking beans or coins. Place the tin onto a tray and bake the tart case for 40 minutes. In the meantime, prepare an egg wash by blitzing 25g warm, leftover pastry with 1 whole egg and 1 egg yolk. After 30 minutes, remove the baking beans and parchment and brush the tart case with the egg wash. Cook for a further 10 minutes. Remove from the oven. Once the pastry is cool enough to handle, (but not yet too brittle to work with), take a sharp knife and run it around the top of the tart tin to remove the excess pastry, then leave the pastry to cool completely. For the Italian meringue, place 65g water into a pan along with the sugar, half of the crushed peppercorns and glucose and bring to the boil, skimming off any froth. Brush the insides of the pan with a wet pastry brush to avoid sugar crystals. Bring the syrup to 115°C, then remove from the heat and immediately pass through a fine mesh sieve. At the same time, place the egg whites into the bowl of a mixer fitted with the whisk attachment. Whip to soft peaks over medium speed. Stop and scrape down the sides of the mixing bowl and increase to high speed whipping to stiff peaks. Reduce the speed of the mixer and gradually add the syrup to the egg whites, whisking until fully incorporated. Continue whisking until the bowl is cold to touch. Stop the mixer and remove the bowl from the machine. Transfer the meringue to a piping bag fitted with a star pipping nozzle and place in the fridge until needed. To bake the tart, preheat the oven to 100°C. Place the baked pastry case on a baking sheet, into the oven to warm through for 5-10 minutes. In the meantime, combine all the filling ingredients in a bowl and mix well. Place the bowl over a saucepan of simmering water and allow to warm up until the temperature reaches 63°C. At this point, strain the mixture through a fine mesh sieve into a jug. Using a spoon, remove the bubbles from the surface of the liquid. Slide the oven rack out a bit, then pour the mixture into the warm pastry case inside the oven. 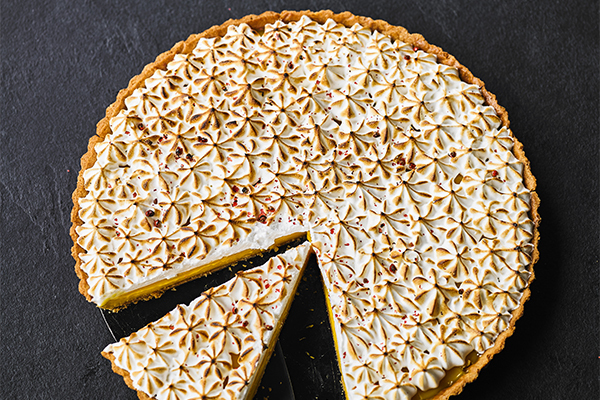 Fill the case to the top, slide the rack carefully back in, and bake the tart for approximately 25 minutes or until the temperature of the filling reaches 70°C. Remove and allow to cool completely.